Every apple contains thousands of antioxidants whose names, beyond a few like vitamin C, are unfamiliar to us, and each of these powerful chemicals has the potential to play an important role in supporting our health. They impact thousands upon thousands of metabolic reactions inside the human body. But calculating the specific influence of each of these chemicals isn't nearly sufficient to explain the effect of the apple as a whole. Because almost every chemical can affect every other chemical, there is an almost infinite number of possible biological consequences. And that's just from an apple. Nutritional science, long stuck in a reductionist mindset, is at the cusp of a revolution. The traditional "gold standard" of nutrition research has been to study one chemical at a time in an attempt to determine its particular impact on the human body. These sorts of studies are helpful to food companies trying to prove there is a chemical in milk or pre-packaged dinners that is "good" for us, but they provide little insight into the complexity of what actually happens in our bodies or how those chemicals contribute to our health. In The China Study, T. Colin Campbell (alongside his son, Thomas M. Campbell) revolutionized the way we think about our food with the evidence that a whole food, plant-based diet is the healthiest way to eat. 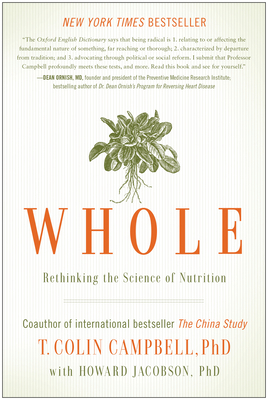 Now, in Whole, he explains the science behind that evidence, the ways our current scientific paradigm ignores the fascinating complexity of the human body, and why, if we have such overwhelming evidence that everything we think we know about nutrition is wrong, our eating habits haven't changed.